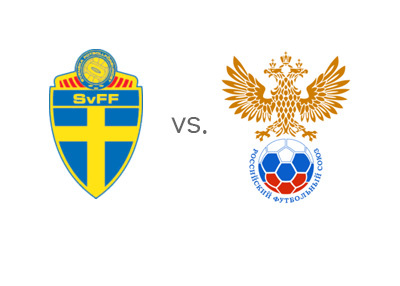 Potentially the most interesting UEFA Euro 2016 qualifications game taking place on Thursday, October 9th, 2014 is the Group G matchup between Sweden and Russia. The game will take place at the Friends Arena in Solna, Sweden, with the kick-off at 20:45 CET. Sweden started the qualifications with a 1-1 draw vs. Austria in Vienna, while Russia comfortably beat Liechtenstein at home with the score of 4-0. Group G is one of the tougher groups in the competition as it also features a strong Montenegro side. The biggest news from Sweden is that Zlatan Ibrahimovic is out with a tendon injury and will likely be replaced by Ola Toivonen, who plays his football in France, at Stade Rennes, as an attacking midfielder. Russia, with Fabio Capello at the helm, are looking to improve on their 2014 World Cup performance, where they finished third in their group, behind Belgium and Algeria, managing two draws out of three matches. Sweden, who had a good home record in the World Cup qualifying (but never made it to Brazil), are the slight favorites to win this match. Let's see how things play out in Group G.